Feeling ho-hum at mealtime? Add some drama and edge to your day with the Tova Dining Chair. The high ladder back demands to be noticed, while its subtle curve makes this chair comfortable to sit in as well. Meanwhile, the contrasting leatherette cushion perfectly complements the rich finish of the solid beech wood frame, and only adds to the overall striking effect of the Tova Dining Chair. Let the style, balance, and elegance of this chair bring your contemporary interior to life! Comfortable seat cushions,, back rest is a nice height and the slats are particularly beautiful when natural light from outside enters my dining room and streams through. The position of my dining room allows for the setting sun to shine through which is excellent for dinnertime. Haven't seen anyone talk about the padding on these seats so i thought I'd mention it especially since it's really comfortable! You never know when you order furniture like chairs and sofas the level of comfort you're going to get. These are softer and much better quality than my old dining chairs. Love them! Slat back looks fantastic!! They have a sort of modern oriental / japanese style about them which is EXACTLY the effect i was going for! The elongated backrest is comfortable and ultra contemporary. These dining chairs completely changed the look of my dining room and I couldn't be happier! Never had I seen a chair like this at this kind of price, Added it to my cart immediately. Thank you for spicing up our dining experience! We do not have any show room or retail locations available in the Miami area. The chairs can be ordered online or via phone at 973-276-0444. 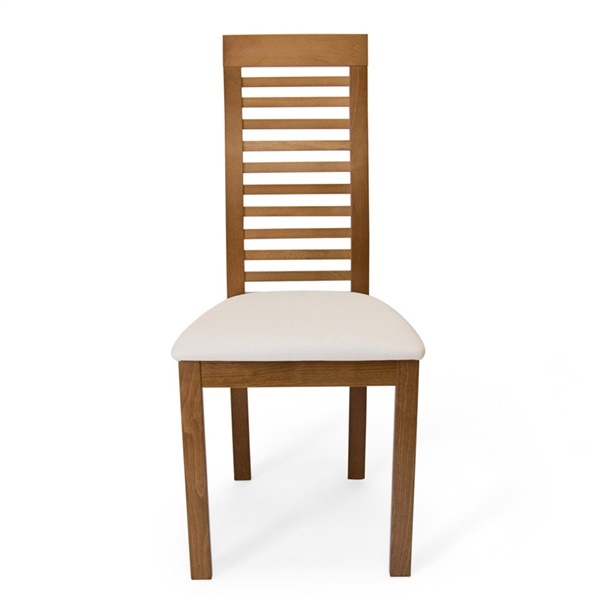 The Tova Dining Chair is made of a solid beech wood frame, with a foam cushion and leatherette upholstered seat pad.